Throughout our journey with Autism (and as a mommy), I have learned a lot...one of the greatest lessons I believe I have learned is to trust your instincts. Call it mother's intuition, a gut feeling, whatever it is...I believe there is definitely something to it. With the idea that if a doctor said something with such certainty, they must know what they are talking about- my mind was much more at ease. Shaun seemed to continue to develop typically- repeating words, picking up new things constantly...at 10 months old, he even started using the potty...every morning, like clockwork...he had no poopy accidents from 10 months to shortly before his second birthday (a distant memory these days!). Everything seemed fine at the time. When Shaun was about 15 months old, his Daddy returned home from a deployment. We'd been living in Indiana with family, which meant a cross country move back to California. As though that weren't enough of a change for a 15 month old, the months to follow weren't much easier...after a brief time in our new home, we took an extended post-deployment leave back to Indiana/Illinois where we visited for over a month before once again heading back to California. It was shortly after all this that things started changing...over time, much of the language that he'd developed started going away and went from nearly potty trained to losing complete interest in the potty. I'd done my research though and knew that regressions were not uncommon at that age when such huge changed occured. And of course, we'd been told there was NO WAY my child would EVER be diagnosed with Autism...there was nothing to worry about. He'd catch back up soon. But over the next few months, that didn't happen and in the back of my mind I couldn't shake the feeling that something wasn't quite right. He had language and the ability to talk, he just seemed to choose not to use it-unless he was quoting scenes from movies word for word that is. Perhaps he was just stubborn. But he also didn't seem to pay any attention to anything we said to him. He wouldn't answer simple questions, verbally or non-verbally either one. ('Where's my nose?') If given the choice between two snacks or two toys, nothing- he didn't seem to understand what was being asked of him. He would not use those words that we believed he had to request something- he'd instead try to climb everything to do things for himself. He didn't seek us for help or to play with him, and when we tried to initiate play with him he showed no interest. And perhaps the biggest red flag of all, at two years old- he still would not answer when is name was being called. No response...at all. These were all huge red flags. Looking back and knowing all that I know now, it was pretty obvious what was going on...and I still sometimes wish I had come to that realization sooner. Still, at the time I was holding onto that reassurance that my child would NEVER be diagnosed with Autism. I don't believe I was in denial at all, I just assumed doctors would be more knowledgeable on the topic. When it came time for Shaun's two year checkup, I decided to bring up my concerns. (Different state, different doctor.) At first, this doctor tried to reassure me with the lines that I know many Autism parents have heard at one time or another- boys often speak later, etc. Still, he took my concerns seriously and actually got down on the floor and tried to interact with my little man. He asked him where mommy was, what he was playing with...simple things most two year olds would respond to in some way or another. Absolutely nothing. And so he referred us to a speech therapist. I later found out that he had a son on the spectrum himself, and I truly believe that was the only reason we were taken seriously that day. Needless to say, the speech evaluation showed us that he was incredibly delayed (particularly in receptive skills) and that he had many red flags for Autism. 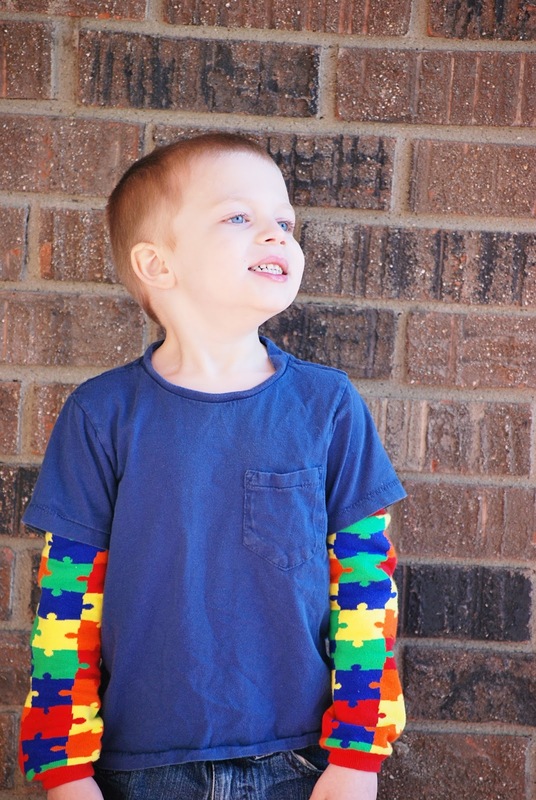 We were sent to a developmental evaluation and he was ultimately given the diagnosis of Autism. The point of our story? Mommy truly knows best! We expect that our children's doctor's should be knowledgeable on issues like Autism, but our story shows that this is simply not the case. And we are not the only ones who have been told by doctors there was no reason to worry, only to later receive that same diagnosis. But as moms, we know our children the best and if you truly have concerns, never hesitate to bring it up...and if their response doesn't settle those thoughts, keep fighting for it! Perhaps in most cases, the doctors (or teachers or whoever it may be) are right and there was truly was nothing to be concerned about, but I'd rather fight to be proven wrong than to settle and realize later that there was something there. This is just one of several cases where mother's intuition proved to be correct for us (there was another more extreme incident where a doctor's refusal to take my concerns seriously landed my little man in the hospital for several days!). Do you think there is any merit to mother's intuition? Have you had any experiences where you knew in your heart that there was something going on that proved to be right? Please feel free to share your stories in the comments!! This is a very eye-opening story. I've also heard the vaccine-autism connection. I'm not sure what to believe. I like your theory about it triggering symptoms that were already there, rather than causing it. That makes sense. Obviously, stats show us that the number of kids with Autism today has skyrocketed since we were kids. But is that merely because fewer people were diagnosed 30 years ago? Or because of an outside cause (I've heard everything from hormones in meat to cell phone use)? I wonder if we will ever find out what causes Autism and why the sudden increase. My friend has an autism son, too! Shaun is very fortunate to have a mother liked you that really cares. This is such a moving post. Your son is absolutely gorgeous! I can't even begin to imagine the stress you've been though and the heartache you've felt, but you seem like a wonderful mother. Keep following your instinct - mothers do always know best! I do believe some doctors simply brush things aside and yet we put so much trust in them. I recommend that everyone - no matter what the reason - gets a second opinion from another doctor. When my daughter was 4 she started coughing up blood. Of course, if this happens to your child, you know something's not right. I rushed to my local hospital 4 times and each time they sent me home, telling me she was fine. How on earth could they say it was fine?! I refused to listen. I visited a hospital in the next city and as soon as one of the nurses heard her cough and saw the blood, she knew instantly that it was whooping cough and my daughter was quarantined and cared for until she was well again. I don't think this was mother's intuition though, just common sense. Thank you for sharing this! You son is so handsome and he's definitely got a great mom in you!